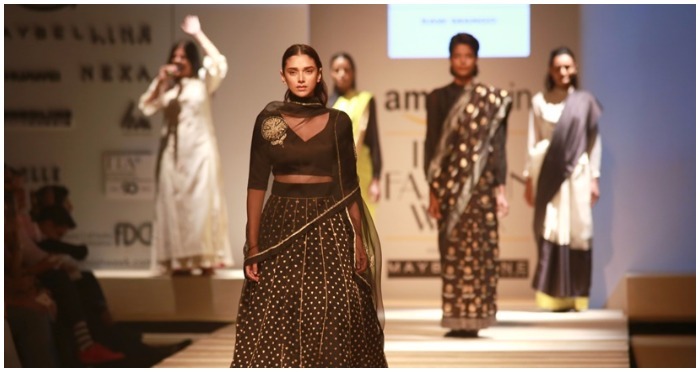 The 28th edition of the Amazon India Fashion Week(AIFW) Spring Summer 2017 in association with Maybelline Newyork has begun from yesterday at the NSIC Grounds, Okhla,. We will get to see 63 designers showcasing their collections at the five-day event gala. The first two days will be dedicated as ‘Handloom and Textile Days’ . Not to miss the grand finale, as we will see the best of two generations. For the first time we will get to see ‘Master & Disciple’ or we can call them as guru-shishya JJ Valaya and Alpana-Neeraj, who will present to the theme called ‘India Modern Festive’. 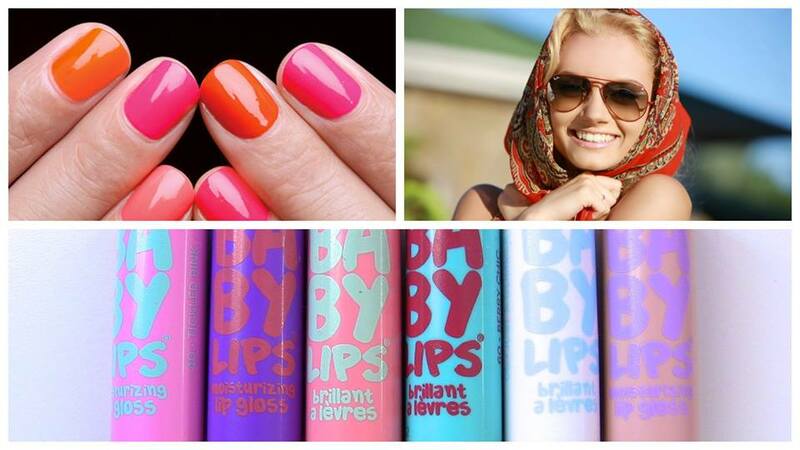 We are already excited, isn’t it!! Day 1 of #AIFWSS17 inaugurated with 16 designers showcased their creations celebrating the heritage and history of our nation by dedicating to chanderi fabric. 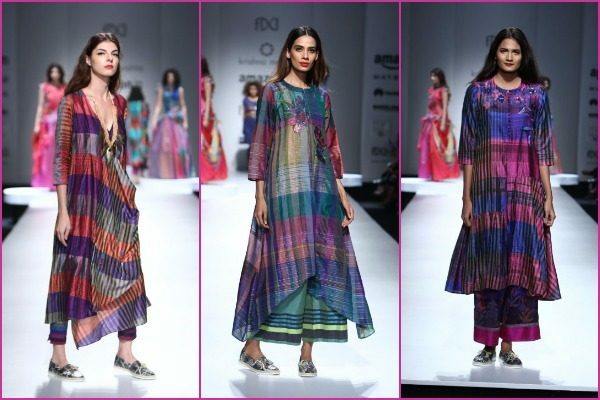 The inaugural day of #AIFWSS17 was a pure reflection of Chanderi silk sarees with belt, assymetrical kurta’s, Palazzo pants with the odd mix of colors and checkered patterns by designer Krishna Mehta. The collection is easy, ready-to-wear and indo-west style is for every girls wardrobe. 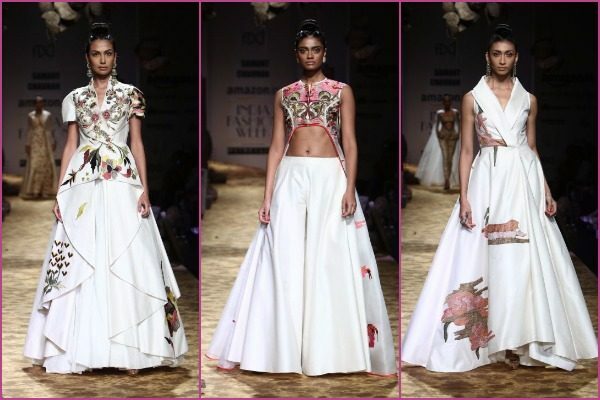 Samant Chauhan choose ivory color as the base of fabric considering best for the summers, with big and bold bright colored prints and embroidery. 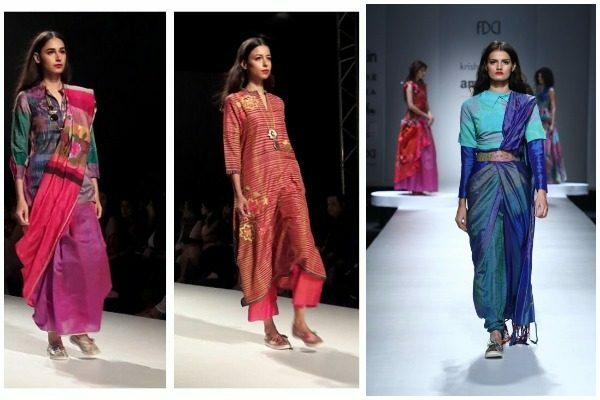 We surely loved the collection of western gowns in chanderi fabric with many different styles to suit everyone’s taste. Best to pick when you have to make at your NRI cousins cocktail wedding. 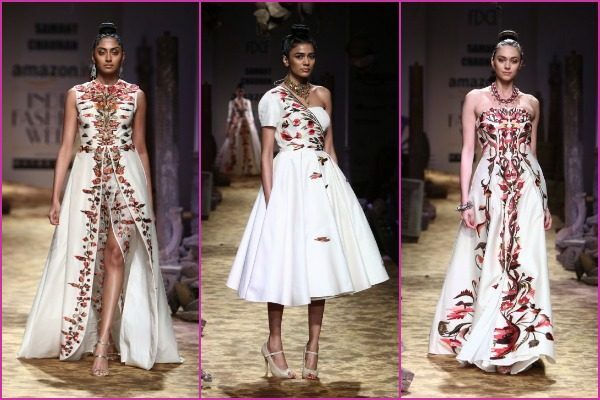 Actress Aditi Rao Hydari looked ethereal as she turned showstopper for Sanjay Garg’s ‘Raw Mango’. 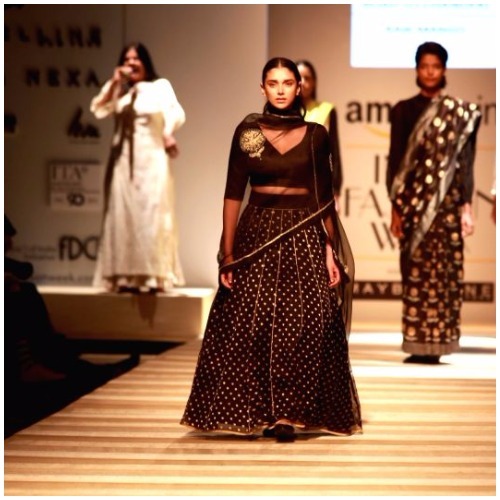 She flaunted effortlessly in Chanderi silk black lehenga with delicate detailing all over the lehenga. 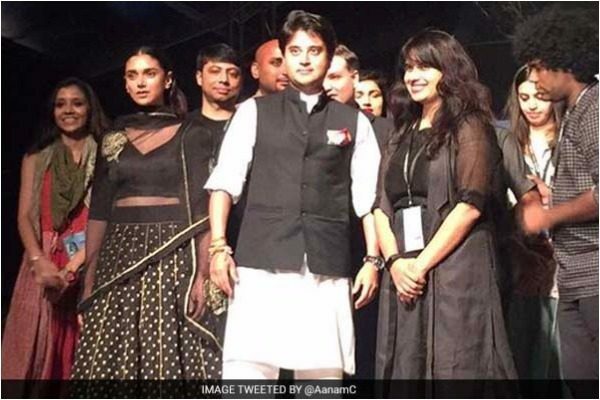 Congress leader Jyotiraditya Scindia also made to the event, who lent his voice for the documentary aimed at the rejuvenation and encouragement of chanderi fabric which is the pillar of his state, MP. 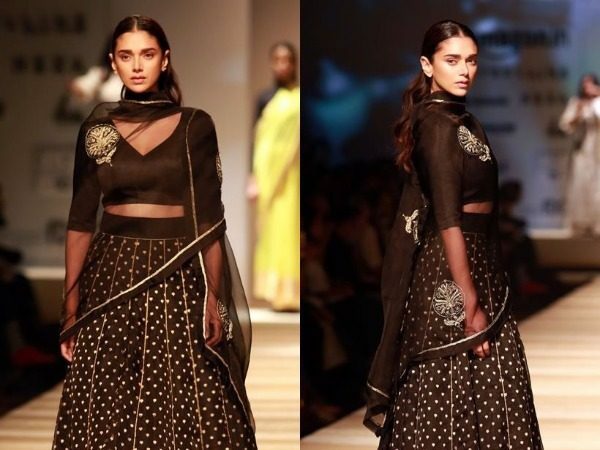 Anita Dongre, Aneeth Arora, Ragini Ahuja, Gaurav Jai Gupta, Karishma Shahani Khan, Payal Pratap, Rina Dhaka, Ruchira Sachdeva, Shruti Sancheti, Atsu Sekhose and Yogesh Chaudhary were the other designers who joined hands to promote chanderi. 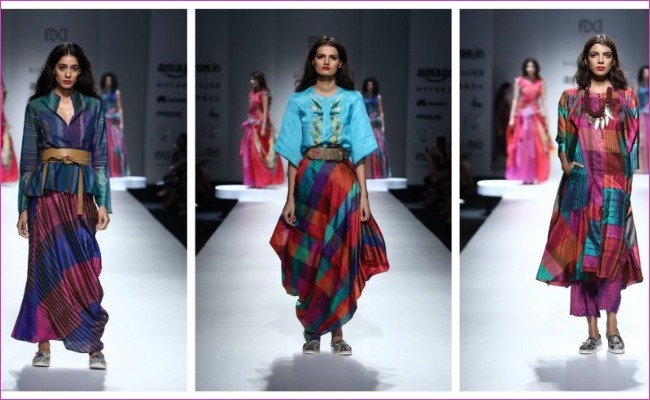 The aim is to encourage the designers to incorporate canderi handloon and textiles into their creations. Stay tuned, as we will bring everything from DAY 2 of AIFW SS17. Next : Deepika Padukone’s Live Love Laugh Dobara Poocho Ad Campaign Urges People To Spot The Signs Of Depression!